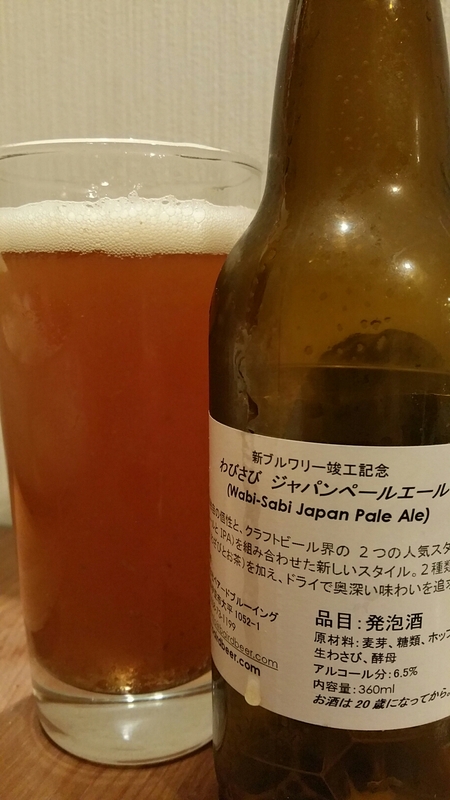 Baird Wabi-Sabi Japan Pale is a hybrid of a pale ale and an IPA. Baird also decided to use some local ingredients; wasabi and green tea, when making this beer. Baird Wabi-Sabi Japan Pale was originally released as a seasonal beer; however, at the time of writing, it has become one of the standard beers in the taprooms that we have been to. Wasabi and green tea are both famous Shizuoka products. Wasabi and I aren’t the best of friends. If you have seen Jackass, then you know about Steve-O snorting wasabi. While I have never done that, wasabi does assault my nose whenever I eat it; a pleasure vs. pain situation. Of course, it doesn’t stop me from eating it but Baird Wabi-Sabi Japan Pale Ale did scare me a bit after being surprised with some spicy caramel sweets a few weeks earlier. The good thing is that the pungency familiar with wasabi is not present in Baird Wabi-Sabi Japan Pale Ale. If it is, then the aroma went straight past me. The green tea aroma was far more noticeable, along with some dosing of citrus too. The body was deep hazy amber colour with a single finger head that dissipated to a thin ring around the edge of the class. I couldn’t help but feel I was being set up for the tasting but water was on hand. Yet the tea was again the more noticeable taste in Baird Wabi-Sabi Japan Pale Ale. Green tea and sweet foods are synonymous in Japanese culture and an edge of caramel to the green tea flavours paired well together. The beer finished off dry and sweet but the wasabi kick failed (or succeeded) in materialising. Baird Wabi-Sabi Japan Pale Ale is an interestingly complex beer and is worth trying though the green tea notes may put people off. Baird Wabi-Sabi Japan Pale can be bought at the Baird Beer Taprooms across Kanto. It can also be bought in bottle from the Baird Beer online store here. GoodBeer sell it here too.